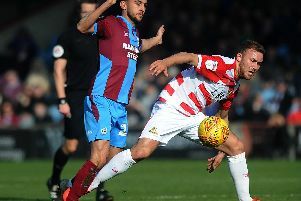 A third consecutive victory may have further strengthened Doncaster Rovers bid for a play-off place in League One but Grant McCann was in no mood to let his players rest comfortably. Last weekend’s 1-0 win at Bradford City maintained Rovers’ five point cushion inside the top six but McCann was left concerned by the performance at Valley Parade and had no hesitation letting his players know that in training this week. And he delivered it with a strong warning that he will not stand for any player resting on their laurels because of the winning run. “This was almost a week of stripping the boys back a little bit,” he said. “Contentment can lead to a defeat. “I keep stressing about the Bradford game but I feel that we slacked off a few things we had done previously, in the two previous games. “I made the players aware of that. I told them I ain’t got no time for tiredness, I ain’t got no time for anyone feeling sorry for themselves. “I haven’t got time for anyone feeling comfortable, thinking ‘I’ve been in the team and we’ve won three games’ – you will come out of the team, it’s as simple as that. “There are players that want to be in this team that work hard every day. “If anyone wants to take their foot off the pedal, we can’t have that. “The players were made aware of that at the start of the week. “In turn, the intensity and the way they have trained this week has gone up because everyone wants to be in the team. “The boys are in a really good, confident mood and had smiles on their faces on the training ground. “It’s not arrogance, just confidence. I sensed that on Thursday, speaking to staff after training. McCann admits he has been delighted with the response from his players in training this week as they gear up for Saturday’s clash with Plymouth Argyle at the Keepmoat. But he says he was a little concerned over what reaction he would get earlier this week. “I was worried when I went in,” he said. “I said to my staff that I felt I needed to get into the boys a little bit. “When you win three games you can get a wee bit ahead of yourself and think you’re okay, you’re doing well.